There are essentially two ways to get your running speed into Zwift. You may have access to a Bluetooth-connected treadmill which can send your speed directly to Zwift or, like most people, you will use a footpod. Arguably the more flexible option, a footpod frees you up to use any treadmill in any Internet-connected location. Of the different footpods available, the Zwift RunPod is the most cost-effective way to access Zwift Run. The Zwift RunPod started life as the MilestonePod. The MilestonePod was an affordable, entry-level footpod which gave those new to Zwift Run the chance to experience the game without spending much on equipment. Impressed with the popularity and simplicity of the MilestonePod, Zwift purchased Milestone's assets and brought their core team in-house June 2018. Developers got to work quickly, updating the MilestonePod's hardware while also updating Zwift itself to better support the new pod. The Zwift RunPod was released November 2018, and it continues to benefit from regular firmware updates today. The Zwift RunPod has two jobs. It measures your speed and as well as your steps per minute (SPM), also referred to as cadence. RunPod data is then used by Zwift to make your avatar run or walk in the game, at a pace which matches your real pace on the treadmill. The RunPod clips onto the laces of your shoe, and placing correctly helps ensure accuracy. It should be about 3rd eyelet for low drop shoes and 2nd for high drop, counting from the toes. You can wear the RunPod on either foot. 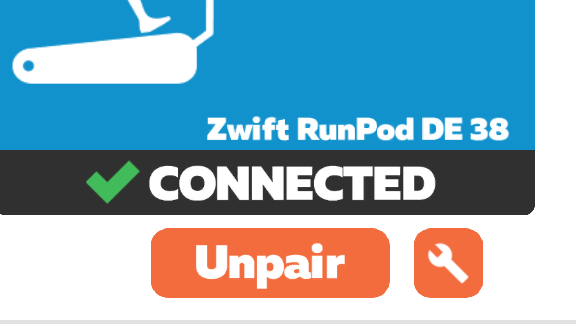 When you log into Zwift you will be presented with the pairing screen. Click Search under Run Speed and Zwift will look for any compatible devices. Your Zwift RunPod should be listed there. Select it and you’re good to go. 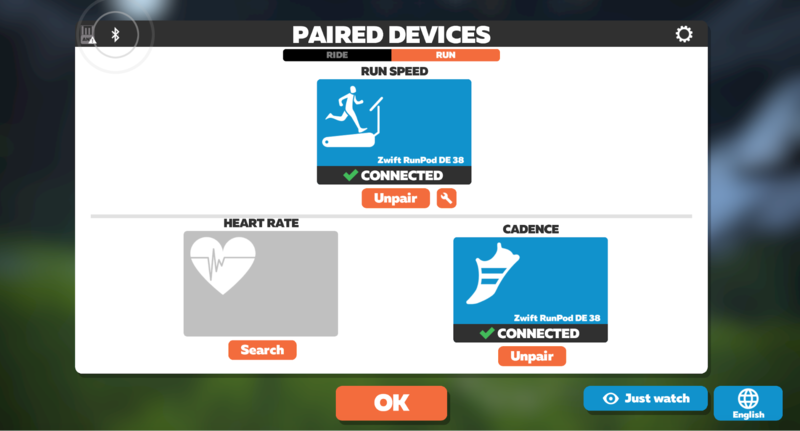 It’s a good idea to pair the RunPod for Cadence in the same way. This will ensure your runner’s leg movements match yours and give your avatar a more natural running gait. There are a number of things you can do to ensure set up of the RunPod is as smooth as possible. First of all, make sure the battery has power. The Zwift RunPod is supplied ready to go. If you give the RunPod a firm tap, a green light should appear, indicating that there is sufficient battery power remaining. If the battery is low, you will see a red light. You can also check battery levels by downloading the MilestonePod App (Android and iOS) and pair your RunPod there. If in doubt, replace the battery with a fresh CR2032 coin cell battery. It is always a good idea to ensure your RunPod is using the latest firmware. Once again, the MilestonePod App (Android and iOS) can help here. 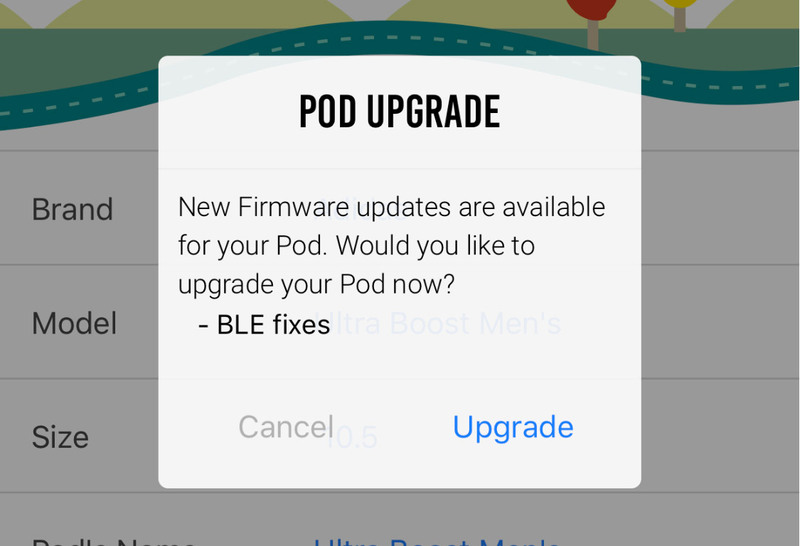 Pair the RunPod with the app and you will be prompted to install the latest firmware. The Zwift RunPod communicates using Bluetooth. Bluetooth signals can only connect to one app or device at a time. So when pairing to the Zwift App, make sure that no other devices or apps, such as the MilestonePod App, are hijacking the RunPod signal. Bluetooth can generally communicate within 10 meters, but other strong signals in the 2.4ghz range can interfere and reduce your RunPod signal strength. Try to ensure your treadmill is no more than 1-2 meters from the device running Zwift. Once your RunPod is paired to Zwift, start your treadmill and your avatar will start moving a few seconds later. The RunPod is at its best when you run at a moderate and consistent speed. It is intended as a cost-effective device for runners new to Zwift. If you are an experienced runner looking to do interval training or someone wanting to run at a particularly fast pace on Zwift, the RunPod may not be for you: see our list of additional supported footpods and smart shoes. If you find that the RunPod does not adequately match the speed of your treadmill, you can calibrate it using the Calibration Tool found on the Pairing Screen. Click the wrench found next to the Run Speed search box. Follow the instructions to calibrate the Zwift RunPod. Once calibration is complete your speed in Zwift should match your treadmill speed more precisely. Overall, the Zwift RunPod delivers reliable and consistent speed and cadence data to Zwift, allowing you to run with an exciting virtual community without worrying too much about technical issues. Having Trouble with your RunPod? Visit the Running Support page, or post a question in our Support Forums.